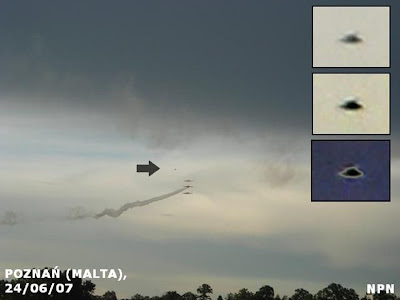 Photos of UFOs taken on 24th June 2007 in Malta. The first one photo was taken at 7:56 p.m. at Inflancka street. We can see there an unidentified object in a shape of saucer passing above three planes flying in formation. On the second one we can see three anomalous triangular formation of three bright lights apparently of different size. The photo was taken when aircrafts were returning to the base, at 8:25 pm. (according to EXIF data). The objects weren’t seen by the participants of the show. “There was a TV team there and was filming everything around. Moreover, there were other people with cameras of better kind than mine, therefore it’s possible that also they could catch some anomalous images” – said the witness. After visual analyze of magnified images from the air show, we cannot find any clues indicating the nature of the object seen on the first one. The saucer-shaped object doesn’t exhibit any features that may indicate that it is a bird or any known kind of other aircraft. It must also be said that the object demonstrated unusual flight abilities. Neither the first nor the second anomalous sight probably weren’t seen by any of the viewers present at the site. 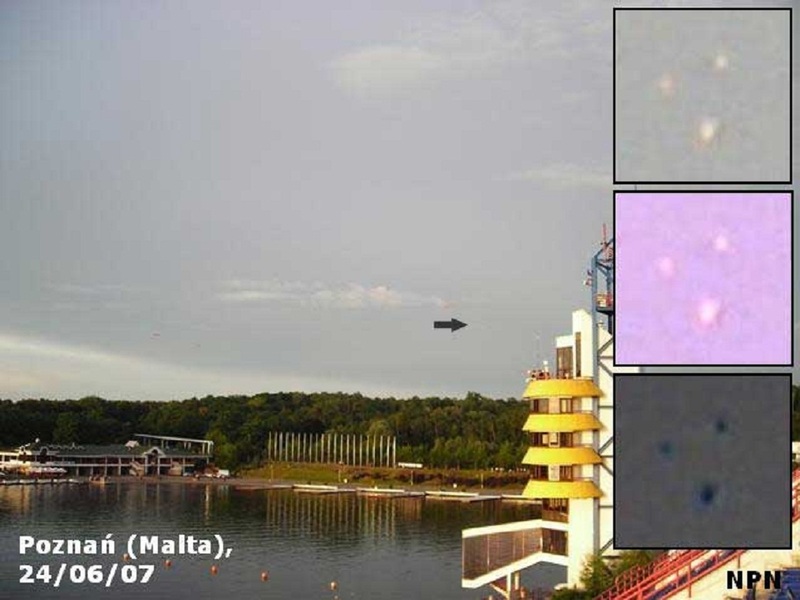 Although 2007 was a year with considerably small number of UFO reports from Poland, presented photos are one of the most intriguing ones. Similar cases of unidentified objects images taken during air shows are often reported in Poland. Although images from Malta can be placed amongst the more interesting ones.